Nowadays you can grow mushrooms in your own home. To do this, you must first find the best mushroom growing kit to suit your needs. There are many different products out there and choosing just one may be a challenge. Before choosing though, you have to look at the features of the products to find out what they have to offer. We've helped you out by narrowing the list down. We've found 5 of the best products out there and reviewed them for you. Among all these, the BRF Jars Brown Rice Flour Mushroom Substrate is the best. 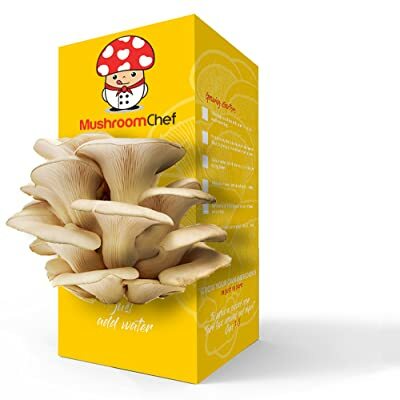 With this product, you can grow different varieties of mushroom species. Simply choose which one you want and start growing. This product arrives already ready for use. It's completely sterilized and comes with an exchange filter for gas. It also comes with an injection port that's self-healing. 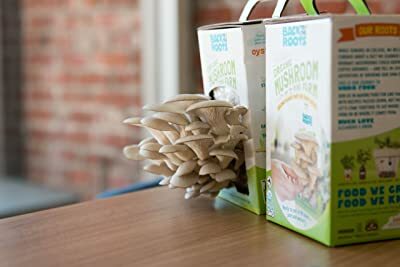 If you're looking for a complete kit that comes with detailed instructions, then you can choose the Root Mushroom Farm—Oyster Mushroom Growing Kit. With it, you can start growing mushrooms in as little as 7 days. 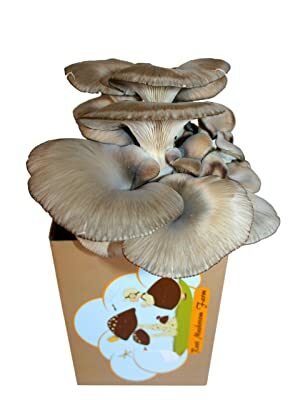 The best product which has a lot of resources is the Back to the Roots Organic Mushroom Mini Farm. It has online resources and recipes you can access to learn all about the mushrooms. It's easy to use and with it, you can grow mushrooms in 10 days. If you want to grow portobello mushrooms, then go with the Seasonal Giant Heirloom Portabella Mushroom Growing Kit. Portabella mushrooms are meaty, thick, and delicious. With this kit, you'll grow a lot of mushrooms, especially at the beginning. But if you want to have a continuous supply of mushrooms, then the Oyster Mushroom Growing Kit Terrarium T101 is the best choice. With it, you can grow a mushroom substrate which will provide you with harvests for weeks. It's ideal for chefs and people who love mushrooms. At this point, you should all be aware that the delectable food item, the mushroom, is a form of fungus. Yes, the same creature that grows on your toenails and other unusual locations. The big difference is that mushrooms are edible and delicious. For chefs, this ingredient is an essential part of their pantry. There are more varieties of this fungus aside from those familiar umbrella shaped ones. Each of the varieties is good and more often tastier than the common varieties. What is often available in the supermarkets is the button white capped mushrooms. There are much more! And with these kits, you can easily grow gourmet mushrooms yourself. Buying these delights is convenient but you can have the option to grow these delights in your own home. It will take some effort and patience but the rewards will be satisfying and tasty. For beginners, it is best to buy with a starting kit. A little experience will eventually lead you to create your own setup. For the moment, the starter will initiate you in mushroom culture. Just buy the kit, follow the directions and wait for the magic to happen. Starting kits will recommend growing the mushrooms indoors. A preferred environment is one where you can control the temperature and moisture levels. Furthermore, you can protect the mushrooms from pests, sunlight, and wind. Placing the boxes or kits outside is not advised. This is a great innovation in growing mushrooms. Not much work to do but regularly spray the box and watch the oyster mushrooms come to life. There is no need for soaking. You can put the mushroom anywhere in your home or office. Just make sure that there is light and an ideal room temperature. In a few days, you can start to enjoy watching the mushrooms grow. And much later, the opportunity to taste these delicacies. They couldn't get any fresher than that. Each kit will give you around 3-4 rounds of growth and a total harvest of about 2 lbs of mushrooms. The manufacturers of this product appreciate any feedback to improve their future products. Contact the producers for any problems and they will find ways to resolve such problem. The mushrooms may not reach maturity. This is also a starting kit for mushroom growers. It's specifically ideal for people who want to grow oyster mushrooms in an organic medium. Just open the box, mist it with water and watch the mushrooms grow right out of the kit's box. After ten days, you can start your first harvest and enjoy them in various kitchen recipes. Unopened, the Mushroom Mini-Farm kit can last for months. This is an ideal gift for friends and family. The instructions are quite confusing. This is more of a growing medium for almost any gourmet mushrooms. 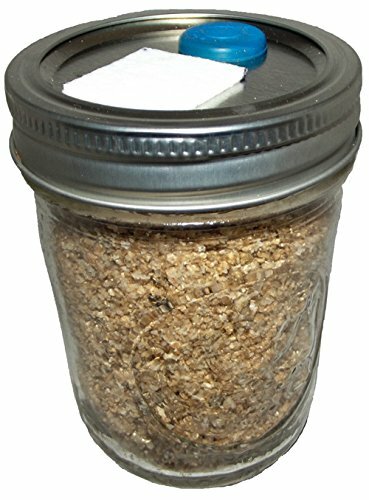 The brown rice flour substrate (BRF) comes in jars that have been fully sterilized. This ensures that they are free from contamination. Simply introduce to the substrate the mushroom spores. Do this through the injection port. The port is flat, blue, and self-healing. Make circular motions with your needle when injecting the spores. Do this to evenly distribute the mushroom spores in the substrate. Wait until the BRF jar has been fully colonized by the spores. Then, you can watch your mushrooms develop into maturity. The BRF jars, by the way, are reusable. The substrate may be quite dry or hard. Portabella mushrooms are big and have a meaty cap. It's wonderful to cook with because of its earthy flavor. They are usually harvested when you can clearly see the gills. It might be a challenging experience growing these expensive mushrooms. But, they're so tasty that the effort is worth it. The portabella mushrooms can be grown indoors and thrive best when kept away from direct sunlight. The first two crops will yield the biggest mushrooms, completely filling the box. Subsequent crops will get smaller fruiting in clusters and in lesser amounts. At some point, the mushrooms will finally stop. You can't grow the mushrooms the whole year. This is another oyster growing kit that promises a harvest after 10 days or even less. The kit's box contains a substrate which has been fully colonized with mushroom spores. These spores are ready for growth. All you need is some moisture and several requirements for such growth. Make the mushrooms have a regulated temperature and a location away from direct sunlight. The spores will start their growth and may be ready for harvest in ten days or less. You can then enjoy the fruits of your labor in salads, in pasta dishes and more. Fresh mushrooms have many health benefits. These include lowering cholesterol and blood sugar levels. You can only grow 1 mushroom variety. Raising mushrooms by gardeners should prove to be a new challenge. It takes different skills and patience than growing flowers and vegetables. But think of the rewards. Serving a juicy steak topped with fresh mushrooms from your home garden will certainly impress your family and dinner guests. Best of all, it is a healthy food. Take the challenge then. It will be worth it. Depending on experience, there are two approaches to growing mushrooms at home. For beginners, it will have to be the mushroom kit available in mostly all garden stores. You can even purchase them online. The basic starter kit includes a substrate which already contains the mushroom spores. Growing the mushrooms is not that difficult. Just follow the instructions and you are on your way. Open the box, provide moisture, and regulate the temperature. Follow the steps according to the manual and keep the box away from direct sunlight. Now watch the mushroom grow. For the more advanced growers, preparations can longer. This is especially true if they would be growing mushrooms on sections of logs in their gardens. A little more complicated but more effective and rewarding. The kits they use include sections of dowel scored lengthwise. These give the liquid culture of mushroom spawn a place to attach. Here's some interesting information that may surprise you. The simplest home mushroom growing can be by using toilet paper as the growing medium. If interested, Google the procedure for more information. Aside from the all-too-ordinary buttons, there are several more exotic mushrooms out there. These can be grown at home to make them more affordable. These include shiitakes, oyster mushrooms, lion's mane mushrooms, portabellas, and much more. The mushroom spawns usually come suspended in liquid cultures. These are then injected into the growth media through syringe-like devices. Oyster mushrooms are the most common for growing in kits. These also come in several varieties including brown, golden, pink, trumpet, and king. Mushroom kits usually come with sterilized containers and growing media. These ensure that no other harmful spores are present when raising your mushrooms. Mushroom spores are then injected into the media. After several weeks, you'll see a network of fine white filaments called mycelia. These should grow all throughout the substrate. In these kits, you can cover the pots which fit into a growing tray with a plastic greenhouse dome. This will create a more humid environment that will encourage the mycelia to shoot up mushrooms. Other kits, instead of pots, use sterilized growth bags. Growth media also come in several varieties. These include straw and horse manure, brown rice flour, coconut coir or fiber, mushroom composts, and rye grains. There are several things you need to know before deciding to store your magic mushroom kit. First, think about how long the shipping time is. If it took just a little while, like maybe a week or less, you can still safely store your mushroom kit. If the shipping took longer, it is best that you start your mushroom farm as soon as possible. You should store your mushroom kits in a cool environment and this is not possible during shipping. There shouldn't be considerable damage to the grow kit. But warm temperatures will reduce the preservation time of the kit. Also, check the production kit date. You can find this date on the front side of the cardboard box. You can still use the grow up a month after this production date. Best advice is to use the grow kit as soon as possible. Have you ever considered how to store your magic mushroom kit? There may be times when you buy a kit then realize you're not ready for it. It is best to store the mushroom grow kits in the refrigerator. Do this if you're planning to use it at some later time. Just be sure there are no spoiled foods or dough or yeast in the fridge. These will attract unwanted fungus and bacteria which can cause damage to your grow kit. Get rid of these items, disinfect your fridge with spray or wash with antibacterial soap. That should make for a safe storage for your mushroom grow kits. You can also use a plastic bag to protect your grow kit. As an extra precaution, put your kit inside a plastic bag or seal it in with a ziplock bag. This will further insulate your grow kit from bacteria and fungus invasion. Again to reiterate, your fridge should be spot clean. There is an ideal temperature to store you mushroom kit. The best temperature for storing your grow kit is between 2-8 degrees celsius. Try to maintain that in constant. Avoid bringing the kit in and out of the fridge. Just leave it there until it's time to use it. You can put your grow kit in storage for up to 5 or 6 weeks tops. After that, the kit will still work but the mushrooms won't grow as well. Remember the mycelium in your growth kit? When put in storage, the mycelium goes into hibernation. As it gets older, it loses strength and this will cause less growth in mushrooms. Once you have finally decided to grow your mushrooms, get it out of cold storage. Let it adjust to room temperature before commencing. Remember to read and follow the instructions in the manual when using your grow kit. You don't want to find the best mushroom grow kits out there only to waste it because you didn't follow the instructions. As you can see, there are many great products out there. You can select the best mushroom growing kit for yourself from our list. Any of these products will prove to be a great choice if you want to grow some mushrooms. 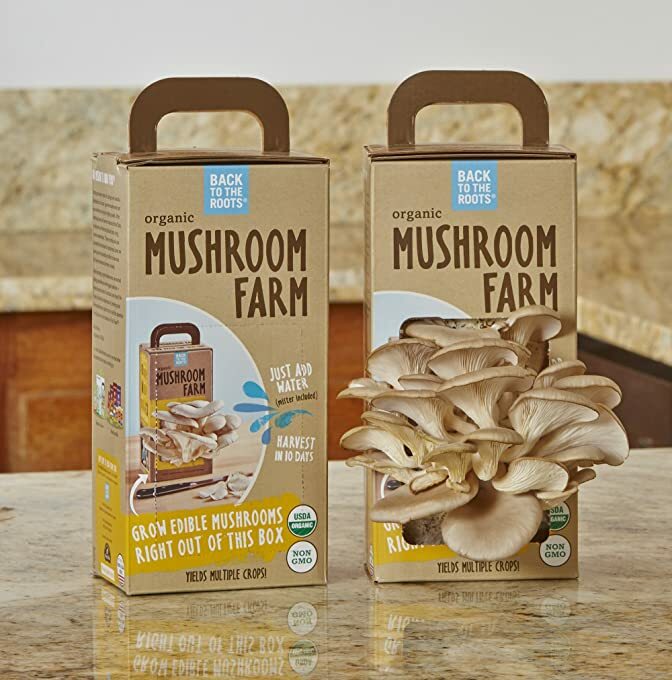 The Root Mushroom Farm Oyster Mushroom Growing Kit is a great innovation in growing mushrooms. Not much work to do but regularly spray the box and watch the oyster mushrooms come to life. In a few days, you can start to enjoy watching the mushrooms grow. And much later, the opportunity to taste these delicacies. 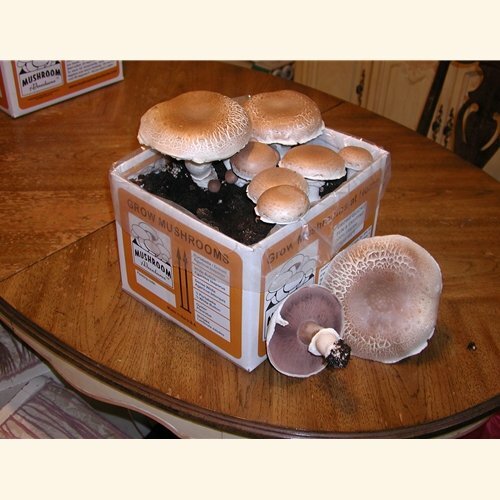 The Back to the Roots Organic Mushroom Mini Farm is also a starting kit for mushroom growers. With it, you can grow oyster mushrooms in an organic medium. Just open the box, mist it with water and watch the mushrooms grow right out of the kit's box. After ten days, you can start your first harvest and enjoy them in various kitchen recipes. With the Seasonal Giant Heirloom Portabella Mushroom Growing Kit, you can grow tasty portabella mushrooms. Portabella mushrooms are big, with diameters ranging from 4-5 inches. It has a meaty cap that is wonderful to cook with because of its earthy flavor. The mushrooms can be grown indoors and thrive best away from direct sunlight. There's also the Oyster Mushroom Growing Kit Terrarium T101. This is another growing kit that promises a harvest after 10 days or even less. The kit's box contains a substrate. It has been fully colonized with mushroom spores and ready for growth. All you need is some moisture, a regulated temperature, and a good location. Keep it away from direct sunlight so the spores will start their growth. But our choice for the best product is the BRF Jars Brown Rice Flour Mushroom Substrate. This is different from the others because it's mainly a substrate. You need to inject mushroom spores in it first to grow mushrooms. This means that you can choose which mushroom species to grow in it. Also, it's completely sterilized and ready for use.